There appears to be a small flap in the New York City Council while in Congress they are giving a pass and almost lauding the tropist. We will just mention this quickly now and allude to it when necessary as the Tropes. We have all heard, read and likely talked about the newly elected Minnesota Representative Ilhan Omar and her spiteful and hateful messages concerning Israel and American Jews using anti-Semitic tropes from the Nazi era and what are now found in common speech throughout the MENA Arab nations. The Democrat elites, while shaking with severe trepidation have excused her remarks as simply something from her culture and from having lived much of her life in Somalia. Ms. Omar is not even close to being in jeopardy of losing her prestigious seat on the Foreign Affairs Committee, a committee which forms the United States foreign policy including Israel and where often classified and even top secret information from the military, CIA, FBI and NSA is entered into evidence during briefings. But all will be fine after Ms. Omar has had time to adjust to her new position and we probably will not hear any more such outbursts, or at least there will not be as many so quickly. We know we will probably hear less of such hateful messages from Ms. Omar likely due to the media refusing to report on it allowing her to get a pass. Sure, a few places will cover it from some on the extreme alt. right who, like David Duke, agree with her sentiments as well as her fellow travelers on the extreme left and within the Islamic community such as Alexandria Ocasio-Cortez (left) and Rashida Tlaib (Islamic) who claims that she is in the Congress such that the Palestinian Arab voice will be heard. One can only wonder what their voters now think and it will be interesting to see the future if these three are representative of what to expect. But perhaps we should look at the other extreme which is in many ways more of the same as in Congress, just with a different twist. New York City Councilman Kalman Yeger, who represents the Haredi Brooklyn neighborhood of Borough Park, has faced somewhat a bumpy road when he stated that the controversial Minnesota Representative Ilhan Omar an anti-Semite. This actually just added to his problems as he had also Tweeted a geographical and historical truth, “Palestine does not exist.” Well, it is true, Palestine does not exist. There, now we’ve said it, again. Would you like to hear it again? OK, the person in the back yelling, go for it, you got it, Palestine does not exist. Councilman Yeger is losing his seat on the City Council’s Immigration Committee. New York City Council Speaker Corey Johnson insisted, “I very vigorously condemn his comments in no uncertain terms. The best thing about our city is our diversity, and that includes our Jewish community and it includes our amazing Palestinian community as well who live here.” But then, according to the New York Post, Councilman Kalman Yeger doubled down likely for a third time telling them, “There is no state by that name; there is no place by that name. That’s a fact. I did not make it up.” Oh, but in our new age of intersectionality, stating this specific truth puts you on the wrong side, politically. Defending Israel is out and replacing Israel with Palestine is in. This was made all the more evident with a number of the responses Councilman Yeger received from a broad array of leftist Democrats and Islamists. Leading the Democrats is the card carrying Communist and Mayor of New York Bill de Blasio, who said on WNYC radio, “If you’re asking my personal opinion, yeah, I think someone who has the ability to say that about Palestinian people by definition should not be on the Immigration Committee.” He stated further, “Now, if he comes out and he apologizes, and says, ‘Look, I was wrong and I realize what I did was hurtful and I’ve got to change,’ different discussion. But if he’s not going to apologize, he shouldn’t be on that committee.” New York Mayor Bill de Blasio also took to Twitter to have his say recorded in digital eternity, otherwise known as the data files at NSA Nevada complex. We have included this post below to assure it makes it into the complex files. Linda Sarsour also insisted she be heard, issuing a statement which included remarks such as “this kind of hate” and “bigoted,” and demanding that Yeger “apologize publicly to Palestinian New Yorkers.” Hey, Linda, tell us how you really feel. But Councilman Yeger does have those supporting his position and giving him their full backing. One such supporter, and an impressive one at that, if we may add, was Rabbi Steven Pruzansky, Eastern Regional Vice President of the Coalition for Jewish Values (CJV), who injected this into the conversation stating, “There has never been a country called Palestine. Jews have been connected to the land of Israel continuously for 37 centuries. Find a ‘Palestinian’ writer from the 6th, 16th or 19th Century, and you will find a Jew. In 1948, the Palestine Post became the Jerusalem Post. ‘Palestinian Arabs’ are a late 20th-century creation, concocted for the sole purpose of thwarting the national state of the Jewish people.” We could not have put it any better ourselves. Additionally, Rabbi Dov Fischer, Rabbi Pruzansky’s Western Regional counterpart, chimed in with the following commentary, “when Ahmed Shukairy launched the PLO (Palestine Liberation Organization) in 1964, the ‘Palestine’ he sought to ‘liberate’ was Tel Aviv and Haifa. It was a ploy — they used the name Palestine because it was too ridiculous to call for the ‘liberation’ of Judea from Jews.” The Rabbi definitely has a point, it would have sounded exactly as it actually is had they decided to announce the truth, that their desire is to steal the two areas where the ancient kingdoms of Israel and Judea were located. Before the division over who the rightful heir was to the throne, the Kingdoms were originally the Hebrews often referred to by the Prophet or Judge who was the ranking person or the Cohen Gadol until they demanded to have Kings. Then the first King was Saul, followed by King David and finally by King Solomon. 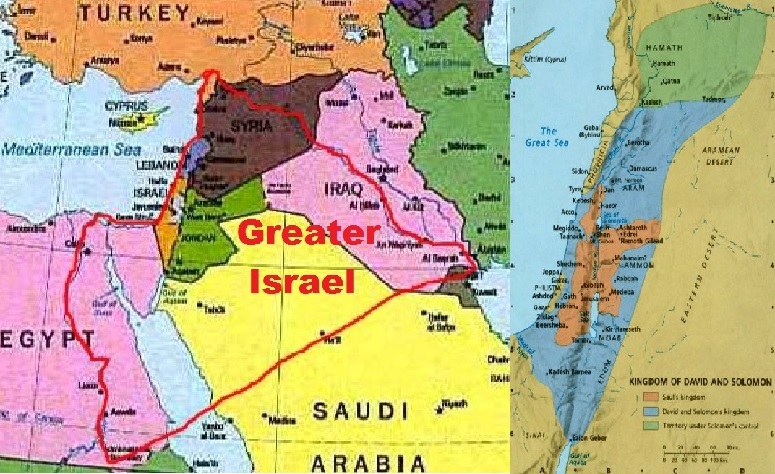 They formed what historians refer to as Greater Israel. 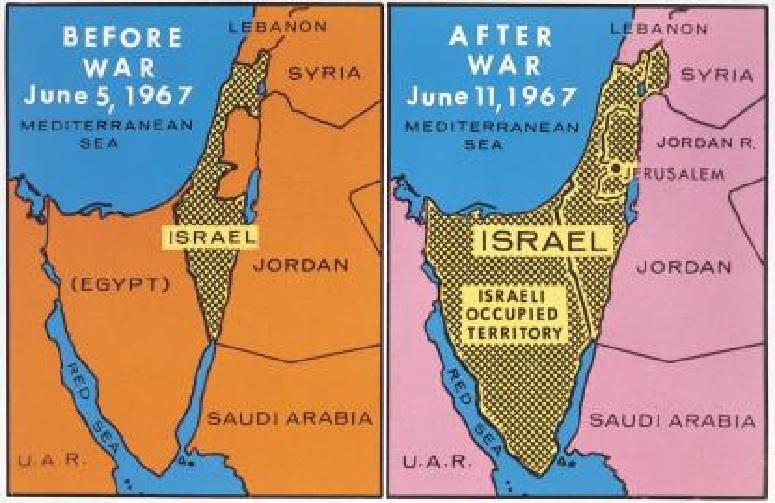 This term, Greater Israel, has been used also to attack the Israelis claiming that Israel desires conquering all the lands between the Euphrates River and the Nile River (see comparison below). The truth is Greater Israel was a historic period under Kings David and Solomon (see comparison below). They conquered a fair piece of land which stretched from the Euphrates River in where today is northern Syria and south to the Wadi of Egypt, sometimes called the River of Egypt as it marked the northeastern limit to the Egyptian Empire and the border of the Sinai Peninsula. There are no plans, desires, ulterior motives or any other nefarious plans to expand the borders of Israel beyond those promised by the League of Nations and agreements with the British over the Mandate lands which defined the eastern border of Israel and the Jordan River. Under International Law and every legal definition, the eastern border of Israel is the Jordan River unless Israel were to legally sign away all rights to these lands, which is why the European Union, United Nations and the remainder of the hordes attempting to destroy Israel piece by piece if required insist that Israel recognize an Arab state called Palestine and define its borders such that Israel relinquishes all claims to the Jordan River as her eastern border. 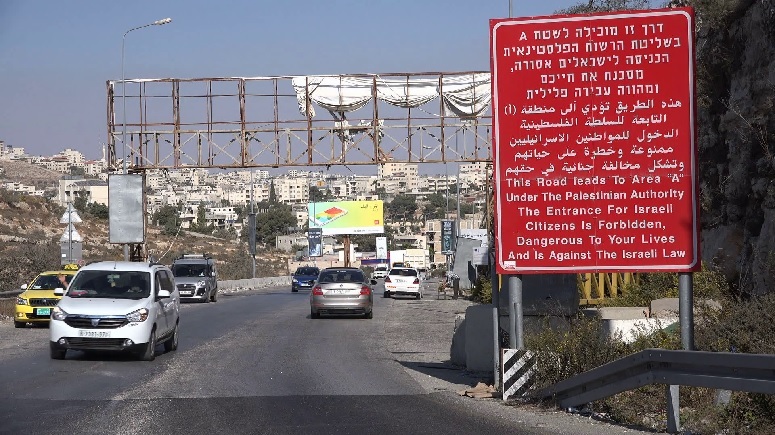 No such agreement has been reached despite numerous offers by Israel to grant actual borders to an entity named Palestine but the Arabs have always refused any compromise. The Arabs, and this includes the Palestinian leadership, insist on only one solution, the dissolution of the Jewish State, all the land being placed under Arab rule and the Jews removed by whatever means are required. As history has proven to the Jewish People, Israeli Jews can pretty much expect every last nation on the globe to refuse to permit any Jews across their borders should Israel ever be defeated which will lead to the wholesale slaughter of the Jews of Israel by whatever conquering Islamic Arab armies might ever succeed with the destruction of Israel as the Jewish State. The entirety of the refugee “Right of Return” being claimed by the Arabs, this taken from the Jewish Right of Return Law, is designed to place many tens of millions of Arabs into Israel such that they become the majority and vote the Jews out of their homelands. Everything that the Arabs design and attempt to execute are simply new means of destroying the Jewish State which was the purpose behind the Khartoum Resolution and the “Three No’s,” “no peace with Israel, no recognition of Israel, no negotiations with Israel.” Facing this as the basis for all dealings with the Palestinian Arabs and one quickly sees that they are not negotiating, not recognizing, and through terror not permitting peace to exist for Israel. 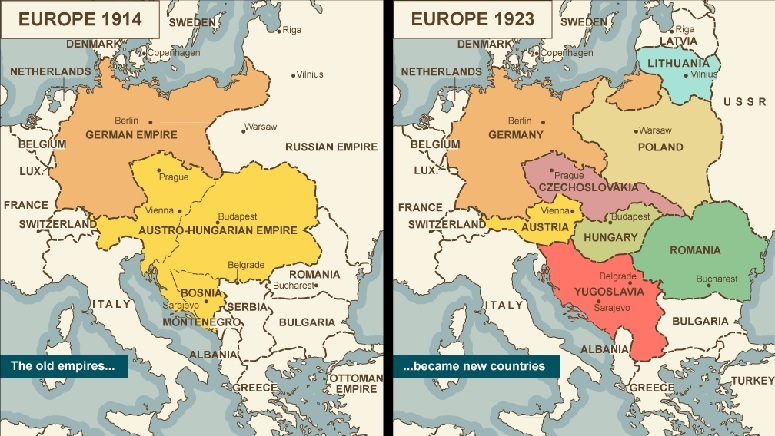 With lies such as the above pictured, one can see how people can be led to believing the Jews are attempting to conquer the world. This was the basis behind the forgery printed by the Tsarist government titled “The Protocols of the Elders of Zion” which has been used by virtually every anti-Semitic group to prove the nefarious desires of the Jews and their plan to rule the world. 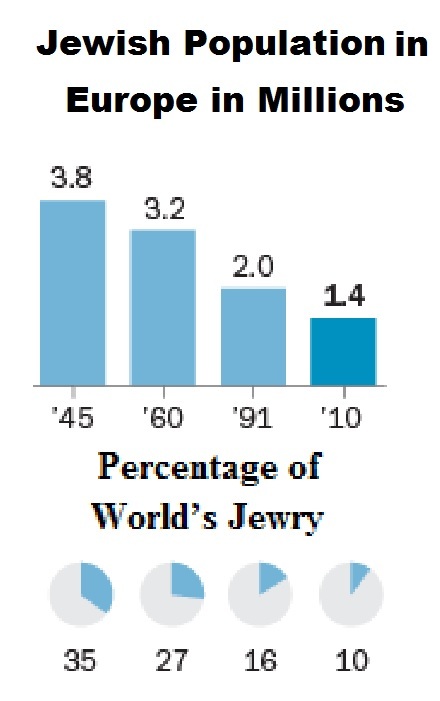 Anyone believing that the Jews, all 0.2% of the world’s population, could ever dominate the world is so far beyond ludicrous that it is hardly worth countering our accusers. 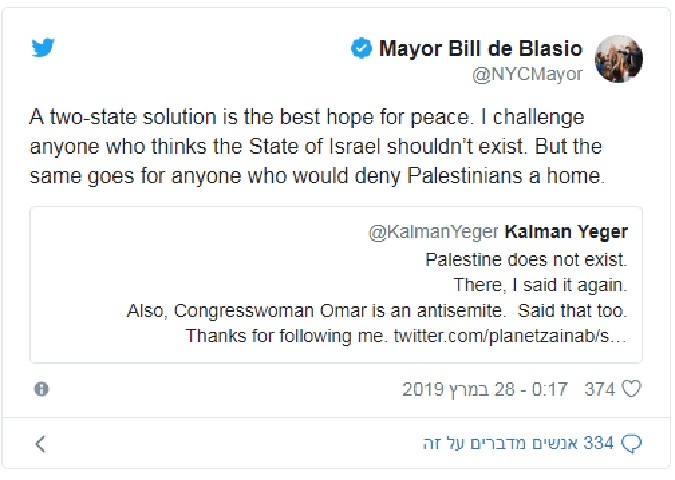 Yet we have sitting in the United States House of Representatives at least one Representative, Ilhan Omar, who is openly anti-Israel and very likely anti-Semitic and this bigotry and hatred is excused while she sits on one of the most important and powerful committees in the land but a New York City Councilman, Kalman Yeger, is unsuited and removed from the New York City Council Immigration Committee because he stated a geographic fact which hurt a few select powerful people’s slanted and biased anti-Israel, anti-Zionist and by being these two they qualify as anti-Semitic beliefs which they wish were true so deeply that they are unable to even abide a completely true and honest statement which contradicts their worldview. 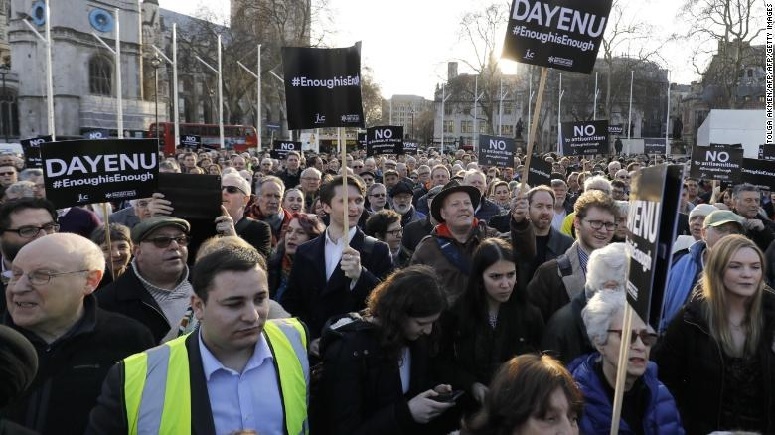 Because these people have the power, they have decided that the truth must be buried, contradicted, ravaged and eradicated before it has any possibility of correcting the party line that Palestine must be real otherwise we cannot continue the terror war against Israel and the Jews. Ultimately, this is what the reaction to Councilman Yeger and his daring to speak the truth, “Palestine does not exist.” Once there was the concept of speaking truth to power, now we have the power making up the truth we are supposed to believe and live by. Sorry, we prefer reality and what actually is to your made up world where everything is sugarplums and whipped cream and things are what they claim they are and countering their reality results in ostracization and rejection. If you find what happened in New York was a disgusting affair, wait until the Democrat Party takes over both houses of Congress and the White House very likely in 2024, then the world will be required to awaken to a whole new reality, their fantasy world will become the foreign policies and domestic policies of the United States. We can only hope that by then Israel has realized what is coming and prepared to do everything for herself by herself because the world will be against her.